Three Rivers Press, 9780307716798, 608pp. Yet little is known about the off-screen De Niro--he is an intensely private man, whose rare public appearances are often marked by inarticulateness and palpable awkwardness. It can be almost painful to watch at times, in powerful contrast to his confident movie personae. In this elegant and compelling biography, bestselling writer Shawn Levy writes of these many De Niros--the characters and the man--seeking to understand the evolution of an actor who once dove deeply into his roles as if to hide his inner nature, and who now seemingly avoids acting challenges, taking roles which make few apparent demands on his overwhelming talent. Following De Niro's roots as the child of artists (his father, the abstract painter Robert De Niro Sr., was widely celebrated) who encouraged him from an early age to be independent of vision and spirit, to his intense schooling as an actor, the rise of his career, his marriages, his life as a father, restauranteur, and businessman, and, of course, his current movie career, Levy has written a biography that reads like a novel about a character whose inner turmoil takes him to heights of artistry. 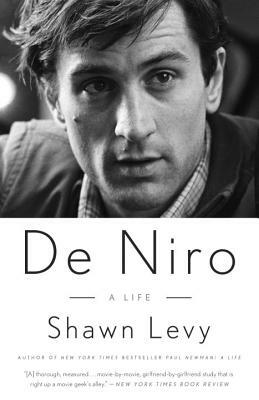 His many friendships with the likes of Martin Scorsese, Meryl Streep, Harvey Keitel, Shelley Winters, Francis Ford Coppola, among many others, are woven into this extraordinary portrait of DeNiro the man and the artist, also adding a depth of understanding not before seen.